This week, U.S. Secretary of Education Arne Duncan testified before the House Education and the Workforce Committee on the FY14 budget. Members of Congress focused their questions mostly on student loans but also discussed topics such as the No Child Left Behind waivers, early childhood education, and the Common Core State Standards. Though Career Technical Education (CTE) was not a primary point of discussion, Representative Joe Heck (R-NV) pressed Secretary Duncan on the U.S. Department of Educationâ€™s proposed Blueprint. He expressed concerns about the hold harmless provision and asked Duncan if CTE funds would be reallocated if the proposed Blueprint is passed. Secretary Duncan did not provide a detailed response but welcomed conversation on the issue. Staff is connecting with Representative Heckâ€™s office and encourages State Directors to make outreach to their Representatives on CTE issues. As reported last week, the House Appropriations Committee released their draft FY14 302(b) allocations which suggest devastating cuts for programs with funding allocated under the Subcommittee on Labor, Health and Human Services, Education, and Related Agencies (Labor-HHS-Education) including CTE. Representatives Nita Lowey (D-NY) and Rosa DeLauro (D-CT) offered amendments to the FY14 budget that were each rejected on a party line vote. Representative Chris Van Hollen (D-MD), Ranking Member of the House Budget Committee, introduced an updated sequestration replacement bill on behalf of House Democrats â€“ the same plan offered by Representative DeLauro at the House Appropriations Committee markup. The bill would replace all sequestration cuts through FY14 with a balanced plan containing $181 billion in deficit reduction through half revenue and half spending cuts. Senators Susan Collins (R-ME) and Mark Udall (D-CO) continue to promote S.465, a bill that would allow agency heads to propose how sequester cuts would be divided for programs in their agency and submit to the Senate Appropriations Committee for approval. Without approval from the Committee, the current sequestration cuts would remain in effect for the agency. This approach would not eliminate the cuts but reshuffle them and could result in education programs competing with one another for funding. Senate Appropriations Chairman Barbara Mikulski (D-MD) has disagreed with this approach and is instead calling for the elimination or replacement of sequester cuts. 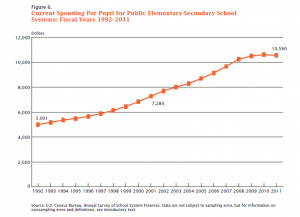 The U.S. Census Bureau this week released an analysis on public education finances. 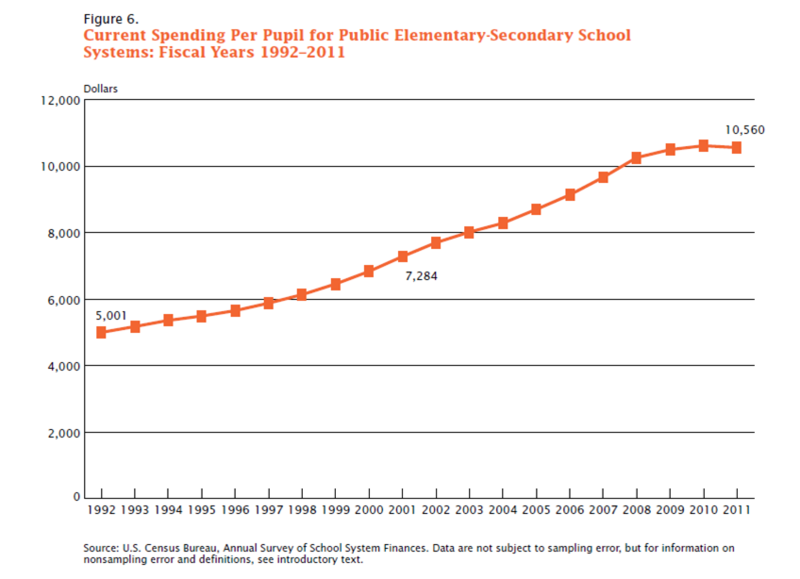 As noted in the report and indicated in the chart, FY11 saw the first drop in per pupil expenditures for public elementary and secondary school students â€“ down 1.1 percent from $595.1 billion between 2010 and 2011 -Â since 1997. This entry was posted on Friday, May 24th, 2013 at 12:23 pm	and is filed under Uncategorized. You can follow any responses to this entry through the RSS 2.0 feed. Both comments and pings are currently closed.